Bro Radio is the local radio station for the Vale of Glamorgan, providing a service mixed with local news, information and interviews. In 2016, the station approached us to create a new website that would showcase the best of whats on air, as well as local news, events and information to help it compete with our media organisations in the County. 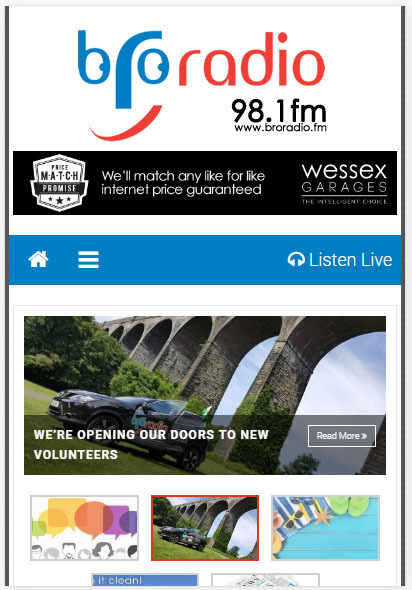 When Bro Radio approached us, they asked us to create a mobile friendly website, that would work for the radio station and its local new content. The website has to have an intuitive back end, to allow both staff and volunteers to update website content with ease and needed to include both Google Ads and paid ad spots for local clients. Based on Bro Radio's requirements, as simple blog based website was created by our team using Wordpress, which allowed website sections to be created that could easily be updated on desktop or mobile devices. The inclusion of Google Ads and paid ad spots allowed the station to make the website cost neutral just one month after launch and in 2018 made the station 500% profit. Communicate Media has continued to maintain the Bro Radio website and provide support where needed.